Rocky Graziano demolishes Charley Fusari. Boxing was an institution in early television for several reasons. It was easy to produce, the camera-coverage area was limited to the relatively small space occupied by the ring, and it had tremendous appeal to the first purchasers of television sets in the late 1940s--bars. Even a TV with a ten-inch screen could become a magnet to sportsminded drinkers. 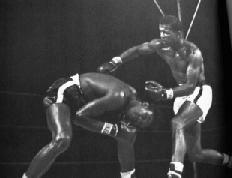 All the great names of the era--Sugar Ray Robinson, Rocky Marciano, Willie Pep, Rocky Graziano, and Archie Moore---appeared on the screen, as well as multitudes of lesser-known boxers who would probably not have had careers if it were not for the voracious appetite of television. Unlike today, when the main interest is in the heavyweight class, boxers in all weight divisions had strong fan appeal when television was new. 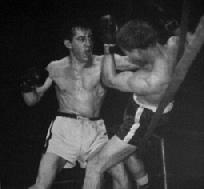 There were periods in the late 1940s and early 1950s when it was common to have as many	as five or six network boxing shows on during the same week, not to mention the local shows that were also available. Those who complain about the saturation of football on television today need only look at the boxing picture in the early 1950s to see what real saturation was. A summary of the boxing shows carried by each network follows. NBC was the first network to carry televised boxing, Cavalcade of Sports began on local TV in the mid-1940s and added network coverage in 1946, with Bob Stanton at the TV mike from St. Nicholas Arena in Manhattan on Mondays and from Madison Square Garden on Fridays. The Friday telecasts, which became the Gillette Cavalcade of Sports in 1948, ran for 14 years, by far the longest continuous run of any televised boxing show. When Stanton, who worked with Ray Forrest for part of the 1948--1949 season, left the series in 1949 , he was replaced by Jimmy Powers. Powers remained the principal NBC announcer until the show went off the air in 1960. In its later years, the Gillette Cavalcade of Sports traveled all over the country to cover top bouts, and other announcers occasionally substituted for Powers. CBS’ boxing coverage was aired exclusively on Wednesday nights. Russ Hodges was the first CBS announcer for bouts originating from White Plains, New York, and St. Nicholas Arena. The series was given the title International Boxing Club Bouts in the fall of 1949, not long before Hodges left to be replaced by Ted Husing inn March of 1950. Husing remained for roughly 16 months; Hodges returned in the summer of 1951, when the title was changed to Blue Ribbon Bouts; and Jack Drees arrived in 1954. Drees and Hodges shared announcing duties during that last CBS year and both stayed with the show when ABC took it over in June of 1955. As was true on NBC, coverage was extended beyond the New York area in the early 1950s, to locations where the most promotable fights were being staged. DuMont’s programming was heavy with both boxing and wrestling in the late 1940s and early 1950s. With its limited finances, inexpensive programming that had a ready audience was something that DuMont could not resist. Dennis James was DuMont’s sports announcer for boxing and wrestling. The DuMont boxing shows, however could not afford traveling to locations where there were no DuMont stations, so that most of them originated from the New York area. Dennis James covered bouts from Jamaica Arena, Queens, on Mondays, from Park Arena on Tuesdays, from White Plains, New York, on Wednesdays, and from Sunnyside Gardens and Dexter Arena on Thursdays. The longest-running DuMont boxing show, however, did not have James at the helm. Ted Husing was the announcer when Boxing from Eastern Parkway (Brooklyn) went on the air in May of 1952. He left in March of 1953 and was replaced by young Chris Schenkel. When ABC picked up the show in May of 1954, DuMont and Schenkel moved shop to St. Nicholas Arena where they stayed until DuMont went out of the network business in 1956. Boxing from St. Nicholas Arena was the last DuMont network series, its last network telecast coming on August 6, 1956, though it remained on as a local program in New York for another two months. ABC’s first major entry into the boxing wars came with Tomorrow’s Boxing Champions, a show featuring young, unranked boxers that was aired on Tuesday nights in 1949. It originated from Chicago, with Bob Elson at the mike. January of 1952 brought Meet the Champ, a collection of bouts involving members of the armed forces, on Thursday nights, with Wally Butterfield announcing. In 1953 ABC’s boxing coverage really expanded. In January The Saturday Night Fights premiered with Bill Stern doing the blow-by- blow; Jack Gregson took over from Stern in the fall. In February a series of Boxing from Ridgewood Grove bouts began on Tuesdays, with Jason Owen as the announcer in the first month and Bob Finnegan taking over until its cancellation in August. March brought Motor City Boxing from Detroit for three months of Thursdays, with Don Wattrick at the mike. In 1954 Boxing form Eastern Parkway moved to ABC from DuMont, with the announcing chores taken over by Tommy Logran, occasionally helped by Bob Finnegan and Fred Sayles. ABC also picked up the CBS Blue Ribbon Bouts when it was canceled and renamed it The Wednesday Night Fights, Russ Hodges and Jack Drees both stayed with the show, but Hodges left in October and Drees was the only regular announcer for the five years it stayed on ABC. When it moved to Saturday, and eventually Friday, the title was again changed, this time to The Fight of the Week. Don Dunphy, released from NBC radio with the cancellation of the Cavalcade of Sports show on Fridays, took over the television commentary in the fall of 1960 and remained with it until faded in September of 1964, the last regular nighttime network boxing series on the air.